Learning how to use an AED properly will take just a few hours out of your day – but it can help save a life, and help give someone more time with those they love. To help you gain the skills you need, at the American Red Cross we deliver the latest information in a range of formats. With best-in-class in-person, online and blended learning courses, we make it possible for adults, teenagers, healthcare providers, school staff and others to learn to use an AED. However, like many things, if you don't use your skills frequently, they can be easy to forget. That's why we've created step-by-step instructions for using an AED that you can print up and keep on your refrigerator, in your desk, or your bag, and refer to when you need them. In addition, we offer online refresher materials that you can refer to any time during your two-year certification period. 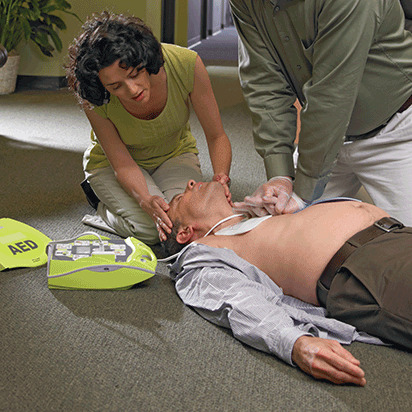 If you've already successfully completed a Red Cross CPR/AED certification course, but need to renew your credentials, you can do so in an abbreviated class that allows you to refresh your skills, demonstrate how to use an AED, and extend your certification by two more years.